So, the floppy unit is wired up directly to the motherboard of your computer? Had you looked at the BIOS settings for an Enable IDE drive. or similar? Such setting was usually found in the first page of the BIOS menu. Also check for the Master/Slave jumper on the physical IDE connection. Thanks. I'll check the bios. Where is the Master/Slave jumper on the physical IDE connection? Thanks Sam. How do I get to the bios? I have a laptop with W7 home on it and a desktop with the same. Hitting 'F2' on the laptop puts up the bios screen. It's a simple one where you move the left arrow over to 'Boot' hit return and you get the boot order. On the desktop however I get a far more complicated screen with lots of options and appears to related to the graphics card. 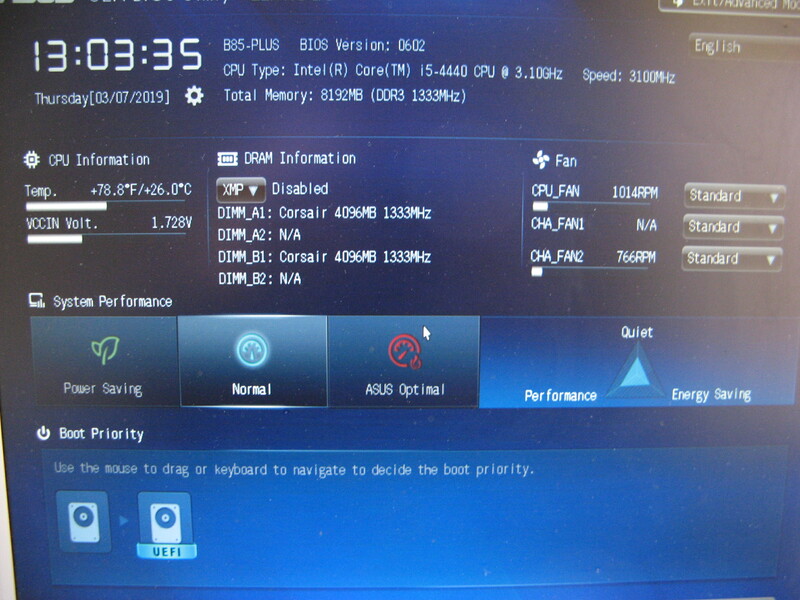 On this particular Motherboard, you need to put the BIOS into advanced mode to be able to access all the options. The Advanced Mode selection is along the top row of options, around about the middle. Then see page 2-29 of the user manual for SATA/IDE setup. For the legacy IDE chipset to work, you have to turn off SATA/AHCI. And you will need the software driver for the IDE device, otherwise the computer wont recognise the operating system. Actually, having said that, you can check Window's device manager to see if the IDE driver is already installed. I attempted an update and reply was it is up to date. Is that all as should be? You won't find a floppy connector on newer MB as the one on post #6.